"The NRA doesn't care. It exists only to represent its member businesses' economic interests. In that sense the NRA too is like a corporation; it is an amoral entity dedicated only to increasing profits. How else can you explain their extreme positions on issues like assault weapons and cop killer bullets?" Upcoming Adult Jewish Learning Opportunities! Scholar-in-Residence: Marsha Bryan Edelman, May 3-4 Well-known scholar of Jewish music Marsha Bryan Edelman will be performing and teaching as Scholar-in-Residence at Netivot Shalom during Shabbat, May 3-4. Erev Shabbat, May 3: Please join us for Shabbat dinner, discussion, and singing! Following dinner, Dr. Edelman will perform with a choir organized from the Netivot Shalom community. Cost for dinner is $12/adult and $5/child. RSVP to office@netivotshalom.org and either pay online at www.netivotshalom.org and use the "Make a Donation" tab and enter "Marsha Edelman dinner" in the description field; or send a check to Congregation Netivot Shalom and write "Marsha Edelman dinner" on the memo line. Shabbat, May 4: Dr. Edelman will deliver the drash, lead us in a special musical musaf, and present the after-Birkat haMazon learning! The after-Birkat program (following the Kiddush) will include a teaching and a performance, again with the Netivot-formed choir. Please join us for what promises to be a richly musical and educational Shabbat! This Scholar-in-Residence Program is funded in part by the Kelman Liturgy Fund. "The Jewish Origins of Christianity; or how A Rabbinic 'Scholar' Sees the World Differently," with Rabbi Harry A. Manhoff, PhD. - Mondays, May 6, 13, and 20, at CNS Rabbi Manhoff will lead a 3-part teaching on the Jewish origins of Christianity. Topics include "Jesus and His Jewish Neighbors, or Why the Pharisees Were Not the Rabbis! "; the Hebrew and Aramaic composition of the Synoptic Gospels; and the Halakhah of Saul of Tarsus (aka Paul). Tuition: $30. 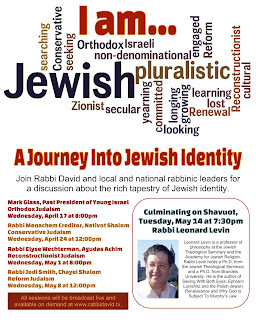 To register, please email office@netivotshalom.org. No one turned away for lack of funds. No one turned away for lack of funds. Author book talk and signing: Marty Brounstein, Two Among the Righteous Few: A Story of Courage in the Holocaust, Sunday, May 19, 10:3 0am - San Francisco Bay Area author Marty Brounstein will talk about his book Two Among the Righteous Few: A Story of Courage in the Holocaust. This is a remarkable true story of interfaith compassion, courage, and rescue, involving a Christian couple in the Netherlands who saved the lives of at least two dozen Jews during World War II and the Holocaust. The story also has a meaningful personal connection to the author, which he will share with us. Book signing follows the presentation. Free and open to all. Morning minyan, 9:30am, and light refreshments will precede this event. "Scars on the Wall" or "Achnai's Return"
where proof of their argument is clear. that's bent now, weighed down by the years. perhaps we can gain what's been lost. What really happened? Did trees really move? Did truth lose the vote way back when? What did God really say before they sent God away? And can we try over again? Click Here to view the Complete Shabbat Announcements! I'm so appreciative that you emailed me your response. I write as the proud brother of a U.S. Navy Chaplain. She might not carry a weapon, but she fights in defense of our citizens and on behalf of what's right in the world. I cannot express how deeply I support your work, and the incredible empowerment and justice I sense in the way you describe the discipline and education and moral character building instilled by your Firearm Use and Safety Courses. I support you and am inspired. My work is not aimed at removing guns from the country or its citizens (though Lord knows if every weapon in everyone's hand was turned into a ploughshare, I'd be nothing but pleased). There are too many ways for people without your commitments to get guns, and I am looking to support healing measures in our cities primarily. And in those settings, as I've learned from my deepening exposure, it is an expectation that while young men will get a gun as a matter of course, there is no education, no learning, no ethical guidelines that accompany that acquisition. Yes, I am afraid as a Jew, given what powerlessness has meant for our people. And yes, I am afraid for the lives of African Americans whose communities' needs are currently being ignored by our government. You and I might actually be hoping for and working toward the same thing: requiring correct training for gun ownership in America. It is clear to me that the talking-points do not give us many opportunities to truly hear each other. I want you to know that I hear you. As a Jew, as a Rabbi, as an American, and as a friend. After Birkat HaMazon Learning this Shabbat: "Martin Buber & the Place of the Past"
We close the Torah service with the Hebrew phrase "Chadeish Yameinu KeKedem / Return our days as of old." Which "days of old" do we mean? And do we really mean it? What role does the past play when Jews dream of the future? 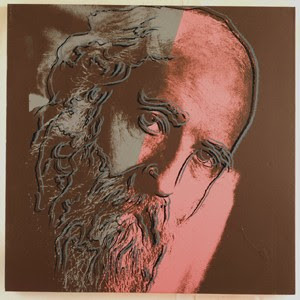 Come examine selections from the writings of Martin Buber and explore what he called "ever-recurring renunciation"! Rabbis for Women of the Wall launched in October of 2010, with rabbinic leadership representing all streams of Judaism, and recent statements by Rabbi Yitz Greenberg and Rabbi Shmuel Herzfeld make it clear that Modern Orthodoxy's support for Jewish Pluralism in Israel is growing. Thanks to the leadership of my cochair Rabbi Pam Frydman and incoming cochair Rabbi David Kalb, I know the path forward will be led by resonant rabbinic power and infused with wise and loving collaborative vision. It is my prayer, as I conclude my term as co-chair of Rabbis for Women of the Wall, that the political power of Charedim in Israel declines and that Charedim do not become targets of Jewish hate. Pluralism is not limited to progressive streams of Judaism. The path ahead must include our whole family. It is my prayer that the State of Israel see itself as the safe heart and nurturing home of the Global Jewish People, affirming Jewish Pluralism and Jewish family. The Diaspora is a legitimate expression of Jewish Peoplehood, and the State of Israel has an obligation to support every Jew in the world. It is my prayer that yearning Zionists, those who love the State of Israel that is and are passionately committed to building the State of Israel that has yet to be, step up and do their part in defending our People's Home. Jewish critique of Israel is only authentic when it is borne in and of love for our People's Home. 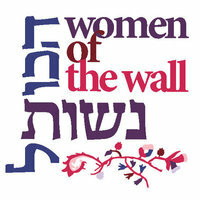 It is my prayer that women, at the Kotel, in the Galil, in Buenos Aires, in Australia, Johannesburg, and San Francisco never again experience the violence and persecution they have endured monthly for almost twenty years, all the while channeling the fire of Deborah the Warrior and the song of Miriam the Prophet. It is my prayer that Jews around the world continue agitating for Jewish Pluralism in Israel, so that no one - no human being - ever again have their voice silenced for being who God created them to be. 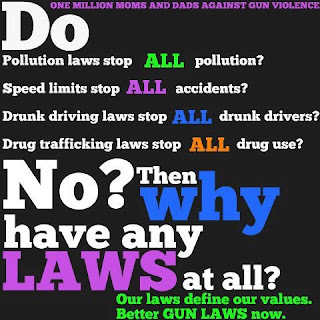 I would like to ask the NRA just one question: "What is your proposal to reduce gun violence in America?" I could ask them many questions, but this one is the most important. I don't need to search for statistics. I don't need to study the Second Amendment. I don't care who is a liberal and who is a strict constructionist. But this I do know: that every day I open the Richmond Times-Dispatch, every single day, there is another report of violence with a gun. It doesn't matter if some one is killed (oh yes it does!). It doesn't matter if they are wounded (oh yes it does!). It doesn't matter if children and elders are frightened out of their whits (oh yes it does!). It doesn't matter if its part of a robbery, a spurned lover, or a broken marriage. It doesn't matter in what part of the city its takes place (no it does not!). It seems to me that every single day of every single month throughout the whole year, that some place in the tri-cities area of Richmond, Virginia there is violence perpetrated with a gun. My personal reading of the newspaper every single day tells me not to believe anyone who says that the rate of gun violence has diminished. No it has not! Cumulatively, either in robberies, woundings, murders, terrorizing, or other acts of criminality, guns are increasingly wreaking havoc in our society, endlessly, ceaselessly and with impunity. The NRA does not want to infringe on anyone's right to have guns. The NRA does not want to infringe on anyone's rights to have guns that fire many rounds in very quick succession. The NRA does not want to infringe on anyone's rights to have magazines for guns that will enable them to fire many rounds in the minimum of time. "What is your proposal to reduce gun violence in America?" "Do you really care?" Or maybe not? "Don't tell me what you won't do! Tell me what you will do!" Is all we get is silence? All we get are more guns? "Do you read the daily paper? 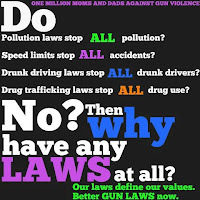 Do you pay attention to the articles on gun violence on the streets of every single city, town, hamlet and village in this country? Have you ever buried a person killed by a gun?" I have! "Did you ever stare into their grave?" I have! "If you were there, what were you thinking? Where you standing there calculating how many votes you would gain or lose? Where you considering your personal score with the NRA? with their life instead of being in their grave?" I ask every single Senator, man or woman: "Are you a 'man' or a mouse?" "What is more important to you – being re-elected or saving a life?" And not just one life, many, many lives! "Do you care?" "What have you done to help reduce gun violence in America?" Have you signed petitions to the President, Senators and Representatives? If so, how many? How often? And if you have, don't stop now! Have you marched in the streets? Have you lain down on the ground as I did in Capitol Square as if I was dead? through leafless branches, not moving and thinking that you are dead? Have you talked to your children about guns? Have you talked to your neighbor about guns? Or have you pulled on blinders and said: "Hear no evil; see no evil; know no evil"? But it is right outside our door! Gun violence is not a City of Richmond "problem." It is not an Henrico County "problem." It is not a Chesterfield, Hanover or Goochland Country "problem." It is everybody's problem. Every preacher from every pulpit can echo these words about their own locations. It knows no race, no ethnicity, no color. Gun violence is an equal geographic, demographic monster. It kills Presidents, Senators, leaders, and the unknown. It destroys the rich and the poor. It is, in truth, the Malach HaMavet, the Angel of Death. As different from the Pesach ditty of Chad Gadya, it is we, not God, who must conquer the Angel of Death. "Do not profit by the blood of your fellow." "Do not stand aside the blood of your fellow." "Do not stand by the blood of your fellow. "Do not rise up against the life of your fellow." I prefer the simple literal translation: "Do not stand ON your neighbor's blood." Whether we walk here or there, in public or in our backyard, in one part of the city or another, the very earth is stained, sullied, desecrated, violated by the blood shed anywhere. Are we capable of literally – not figuratively - standing on, walking on the blood of others? sponsored by Temple Beth Abraham in Canton, MA and Rabbi David Paskin! Don't miss this conversation about the unique gifts that Conservative Judaism has offered the Jewish People! Tune in at www.rabbidavid.tv. This session is a part of a 5-part series at Temple Beth Abraham in Canton, MA on Jewish Identity. Learn more about Temple Beth Abraham at www.templebethabraham.org. Last week, a bipartisan bill to require background checks for gun purchasers fell just 4 votes short of the 60 needed to pass. But we remain resolved to pass comprehensive gun laws that will make us all safer while respecting the 2nd Amendment. Click here to reach out to your Senators. Less than half of the Senate voting against a policy favored by 90% of the country is where our work begins. We have a national need and a national will that cannot be stymied by an uncompromising few. We are in the beginning of the campaign for the comprehensive overhauls needed to make our country safer by ensuring access to quality mental health care, examining the role of violence in our media, banning military style weapons and ammunition, and keeping them out of the wrong hands. Thanks to this vote, we now know the minds that need to be changed. Now is the time to make sure that those Senators who voted no hear the voices of their constituents and act accordingly. In the coming weeks, and with your help, we will continue to let Congress know that the organized Jewish community remains united and resolute on the need for comprehensive gun violence legislation. Click here to reach out to your Senators. There will be hurdles in our work for a safer America, but hurdles are meant to be cleared. TAKE ACTION by thanking our friends in the Senate who voted yes on sensible gun reform and let those in the minority know we are disappointed. We must state clearly that we will not give up on this legislation to make our country safer and better protect our children. Click here to reach out to your Senators. just how graced life can be. Announcing: the Adoption Museum Project! The Daily Californian: "After divestment"
Celebrate Yom Ha'atzma'ut in Berkeley!